Summers growing up in Minnesota were always muggy. High heat and humidity combine to make make up run and smear. I thought things would be better in the higher elevations of the Blue Ridge Mountains, but now I know better. We live in a temperate rain forest and still fight the summer weather. So, what is one to do when you need to be at work or a meeting looking your best, but the weather says otherwise? 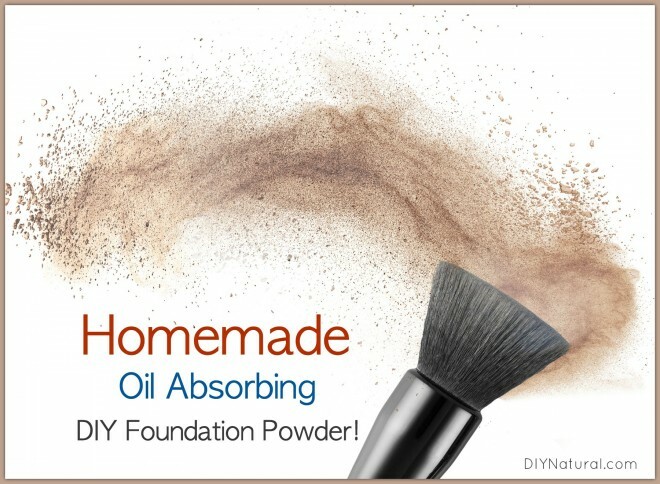 Oil absorbing powder to the rescue! Your body is made up of numerous sweat glands. These release liquid during hot weather to help cool you down. When the humidity is high, sweat won’t evaporate well. You can use a towel on sweat to wipe it off, but what about your face? From the neck up, your face contains many oil glands. You may sweat a bit, but the majority of what you lose is oil. It can be tempting to wipe the oil off with a wet cloth or a baby wipe, but the cloth can take away too much oil, leaving your face to produce more oil to compensate. And commercial baby wipes contain chemicals that may harm the delicate balance of your face and neck. It’s better to blot the oil, then use an oil absorbing powder. When you buy an oil absorbing powder from the store, it can contain several items meant to absorb excess oil. These can be clays, baking soda, talc, ground oats, or any number of chemicals. I’ve fought with many of them and finally made my own. I’m like a glazed doughnut, as my friend would say. Even at over 50 years old, my face is still like an oil slick. In using almost anything on the market, from the cheapest stuff at dollar stores to the most expensive stuff I could find, it all produced the same results. I’d put it on at 7am and by noon you could beam messages off of my forehead. And some of the powders I tried made me itch or break out. I decided there had to be a better way. I started researching what was in the commercial powders I tried. Most all of them contained two ingredients that are sure to cause problems – talc and mineral oil. Powders don’t have to be pressed, but it does make them more convenient than loose powder. In order to press them, mineral oil is used to keep it from turning to dust. Some mixes contain baking soda. Sure, it will help control sweat somewhat and it’s a lighter color, but it is also a salt derivative and it can dry out your skin. And most all of them contain artificial color to make them match skin tones, some of which are not FDA approved. With all the research in hand, I set out to create the perfect blend. Here is the basic recipe along with some variations you might like to experiment with. Whisk all of the dry ingredients together except for the spice. Begin adding in small amounts of the spice(s) you chose until you get the desired shade. If there are larger pieces from the oats, you’ll want to sift these out. Add the liquid a few drops at a time. The powder will gather around the liquid and form a lump. Mash this into the rest and mix it in. You may need to do this several times. Add optional essential oils. You may need less or more oil – adjust it to your liking. To use your powder, place it in a wide, short jar (like this). Using a fluffy brush, tap down into the jar to get some on the brush. Tap the brush on the sides of the jar to get any excess off. Swirl the brush on the inside of the lid – this helps pack some of the powder into the brush. Tap against the lid once more and dust onto your face and neck. Don’t stop at the jawline, but go over and onto the under side of the jaw. Once it is well blended, you’re done. You may need to touch it up once in a while, but it should last most of the day. If you find you need to replace it more often, use a soft flannel cloth to absorb some of the oil and try again. How about you? Have you found a way to control excess oil? What are your best tips? Share in the comments section! Do you have any recipes or suggestion on what to add or delete from this recipe for combination skin? Great site and info! I’m wondering if you know of any liquid foundations on the market that are organic and free of plastic and chemicals? Or is powder as a concealer the best way to go? Thanks! I have very dry skin. Can I use more oil or is there a whole other process to make some make-up? You can use this recipe Sharon, just add some of the vegetable glycerin. Glycerin is a humectant, meaning it will pull moisture out of the air and attach it to whatever it is on. So it will actually draw moisture to your face in a good way. Thank you so much, I am willing to give this a try and am excited about the process. Hi Carol, that really depends on you, but a little goes a long way. I would try just a bit, like 1/4 teaspoon and see how it works. You can always add more if you want. I’ve been wondering about the difference between arrowroot powder and baking soda? so far I’ve only tried backing soda, which does stay matte and feel good, but with a slight tingle. also, this recipe seems more a like a translucent powder than a foundation powder..I’ve been trying to create both and the main difference I’m noting is the use of minerals. Arrowroot powder is from a plant where baking soda is a mineral which is salt based. The salts in baking soda can make you itch where arrowroot is very hypoallergenic. I’d say use whatever works best for you. And actually, it can be either translucent or more like a foundation. You’re right, the difference is in the minerals. Use less for a translucent powder and more for foundation. And like the base, you’ll need to experiment and see what works best for you. What purpose does the oil/vegetable glycerin serve? I’ve seen other “recipes” that use them when you want to make more of a pressed powder but not for loose. I also have very oily skin and my first thought is to leave them out unless they serve a beneficial purpose of some kind. Thanks! If you have oily skin Vikki, I would skip either of these if you don’t want pressed powder. The purpose of the oil is to hold it together and the glycerin is to hold it together as well and also add moisture to the skin. How is this recipe adjusted for normal to combination skin? You don’t need to do much adjusting, Kim. I would use some of the glycerin instead of oil if you decide to go that route. Oil can make your skin oilier but not more moisturized. Glycerin is a humectant, meaning it pulls moisture out of the air, and that’s water, so it will moisturize. I am so excited to try this! I also have extremely oily skin and the description of a “glazed doughnut” made me laugh because I can so relate! Thanks Stephanie! I still “suffer”, but it’s better now. I use pieces of disposable paper toilet seat covers to control shine. You can buy 6 in a packet for less than a Euro here in Germany. The commercial ones you buy are so overpriced and often come in plasic containers that just add to garbage. (and are much too small to cover your whole face). When you buy the packet of toilet seat covers, take them out and then separate and open them fully. (so they resemble a toilet seat) Cut into any size that you want (I tend to cut big pieces so I can blot my whole face) Use the shiny side to blot your oily areas, blot gently as they can remove make up if you press them `into your skin` too hard. Even after I use powder I still get shiny and don´t like layers of powder on my skin. From a packet of 6 I can make over 200 blotting papers..more if they are smaller!! They really do work :). I got this tip from a make up artist. This is a great idea Jenacy! Thanks for the tip.